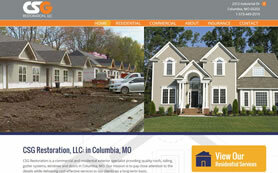 CSG Restoration is a commercial and residential exterior specialist providing quality roofs, siding, gutter systems, windows and doors in Columbia, Mo. Their mission is to pay close attention to the details while delivering cost-effective services to our clients on a long-term basis. We were really excited to work with a company that values the details like we do. One of our favorite things about this website is the array of colors. CSG Restoration’s logo is grey, orange and white. We used these colors at the top and bottom of pages. In the middle, blue and gold was used. Gold is the accent color, so it was used on the navigation buttons at the top of the page as a highlighting color. It really pulls the website color scheme together nicely. Another cool feature is the animation in the navigation. Does your site lack a nice color scheme, or do you just need a site in general? Contact the team at MayeCreate Design. We believe websites work when good design meets solid functionality. Our web designs always aim for ease of use and clear communication. Check out our portfolio for a look at our other projects and to get your pride on…today.